In the spirit of encouraging pursuits and the joy of achieving them, I wanted to share this lovely idea re-posted on one of my favorite blogs, the simpledollar.com. The plan is to make a list of 101 goals to complete in 1001 days and then actually do them (excusez moi?). The most important element of this challenge is a concentration on specificity. I could say with all the wannabe Miss America’s of the world that a goal of mine is “world peace,” but how would I even begin to achieve that goal? Give everyone on this planet a puppy adorned with a collar of wild peonies? Instead, what this particular approach to pragmatic dream-catching offers is guidelines for success in realistically achievable goals, for actually achieving what we we would like to achieve. So, I am going to offer my own list below. Since I absolutely adore categorizing and organizing copious amounts of information into manageable chunks, I am separating my list into four categories of 25 goals with 1 comprehensive “umbrella” goal as a garnish. And to close, I really do want world peace. By reading the first 30 pages or so of Brazier’s book, The Thrive Diet, then skipping ahead to the 12-week meal plan and recipes, I missed a very important section: adapting. Apparently, and as Brazier so wisely advises, our full-of-junk bodies need time to transition to a diet of raw, whole foods. It seems that jumping into this brand of foodie with absolutely abandon is not so ideal. Our bodies get stressed from being forced out of a routine. We go into actual withdrawals for refined, processed foods and artificial stimulants and our internal parts may not respond kindly to an abrupt change in edible offerings. We need, he says, to give our bodies time. 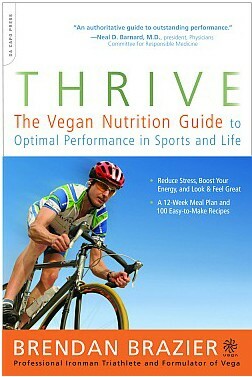 “When you adopt a new way of eating,” Brazier writes, “it takes time for your body to adapt” (86). My failure to read this portion of the book, and my blind-folded swan-dive into raw foods over the past week, is undoubtedly the cause of some major mood swings and other issues that my husband and I both experienced. I am so accustomed to attributing such unfortunate happenings to non-edible uncomplementary stressors (dissertation, where will we be in four months, what am I going to do with my life, I need to change my sheets and vacuum, etc.) that I never imagined part of the problem may have come from inhaling soaked nuts, pureed seeds, and obscure veggies. From eating cocoa nibs, not chocolate, and using nutritional yeast blending with hulled sesame seeds as a “cheesy” topper instead of dairy cheese. From making my own cereal and pre-making almost 20 energy bars. My cupboards cannot physical contain the supply of straight-from-the-earth elements I purchased and immediately started to consume. The food, I surmised, could not be a factor. Then, the other evening, my husband (who found himself turning to Chick-fil-A for a bit of relief) was reading the book and came across the very-necessary-to-read-early-on chapter on adapting. I flipped to that section and read, “The first few days of an optimal diet may not be pleasant.” Hmm. Brazier goes on to write that the worse one feels in the first few days of switching to a nutrient-rich diet, the more there is to gain. Despite being a vegetarian/almost-vegan for several years and already eating some pretty healthy fare, my response to the switch last week indicates that my lifestyle was not as healthy as I thought. Based on the precipitation from my tear ducts and rumblings in my midsection, it seems like I have quite a bit to gain form Brazier’s plan. I need to adapt, and maybe a bit more slowly that I have been. …even, and perhaps especially, when it comes to health. Brazier advocates an eventual and progressive transition into a raw food lifestyle to avoid unnecessary stress. He recommends approaching this diet as a process, not as an extreme sport. So, I’m recognizing now that my body will take time to adapt. I’m still working in as many raw foods as possible (had a sunflower and beet “pizza” for lunch,in fact), but I am not totally disregarding cravings or changes in mood; I’m just spending more time assessing if the craving or mood swing is food-related (and, if so, what food) or related to some other stressor. All that said, though, I can attest to already seeing and feeling beneficial results from this lifestyle change. While last week was difficult as my body whined for salt and refined, prepackaged sustenance, I started this week with some unexpected little victories. My jeans are already a little bit looser. I not only don’t have as many cravings, but when presented with an opportunity the other day to eat French fries without judgement, I didn’t want them. My appetite is smaller, and I feel satisfied faster while eating raw food meals. I couldn’t finish my walnut hemp burger topped with black bean salsa. I was full. Unfortunately, I am not in Tuscany. If I were, I would be sipping Chianti or Sangiovese at a family-owned winery and enjoying the best practices of language learning, immersion. Since my current situation involves sipping inexpensive Syrah from the rustic aisles of the local Kroger, full immersion is not an option. So, per the advice of my fluent-in-French sister and mother, I am creating scenes of pseudo-immersion in the hopes of increasing my exposure to Italian, la bella lingua, as much as possible sans real Italians. To commence these efforts, I changed my language settings on WordPress. My Dashboard, or Bacheca, is awash in technical Italian. This post, or articoli, is a aggiungi nuovo, and my current conteggio parole, or word count, is 126. My newly bi-lingual iPhone instructs me to inserisci il codice to unlock it, and I send messagi to my amici. There’s been a small learning curve, but nothing more than a couple of unintentional text messages and subsequent apologies to the receivers. I’m also opting for Italian entertainment when possible. In addition to my previously discussed obsession with Puccini’s operas, I’m starting to seek out more modern Italian music, such as “Sospesa” by Malika Ayane, and Fred Buscaglione’s “Guarda che luna.” My Berlitz language tracks are a constant play while I drive about, and Roberto Benigni’s films have taken many of my hours. Of course, La vita è bella (Life is Beautiful) is an absolute must-see. My sister also suggested I find the Italian versions to Disney films on youtube, so I have plans to look for Lady and the Tramp in mio nuono amore. But my new, immediate favorite is La tigre e la neve (The Tiger and the Snow). Benigni is rapidly becoming one of my favorite actors, and the dialogue in La tigre e la neve is incredibly charming. Benigni plays a lovesick poetry professor whose own life is like a magically real string of dreamlike verses. Attilio, Benigni’s character, makes beautiful speeches about love and poetry that are as emotive as they are humorous as recited in Benigni’s jaunty, whimsical manner. (It does help, though, that the main love interest’s name in the film is Vittoria, the Italian equivalent of my own.) If you love words, you must see this film. Trust me. I haven’t come to the point of post-it-noting articles in my house with their Italian linguistic equivalents, but I am perhaps not far off from this method. I am still stuck at basic greetings, but I refuse to be discouraged by my lack of opportunity to study. As I said before, this pursuit is not to be contained in the academic calendar. For now, I can greet in Italian and I’m learning to love the culture through as many vehicles as I can without actually being there, and that is not bad for a month’s work. A few years ago I started listening to opera. I first exhausted a Three Tenors album, then gradually expanded my “collection” primarily with famous arias from renowned Italian composer Giacomo Puccini. From the first time I experienced Pavarotti’s beautiful voice engulf me in “Nessun Dorma” I was hooked. Opera, and especially Puccini’s works, became a solace. After long days at school I would come home, sit in the middle of my living room floor, a glass of Chianti or Cabernet in hand, and crank my favorite arias to 11. Puccini expressed through Pavarotti was a constant comfort and pleasant distraction during my doctoral comprehensive examinations. I found myself rapidly transforming from feeling dejected to alive and, even, passionate about feeling alive from the first few sonorous notes. I suppose Puccini had me at Turandot. Puccini, finalmente ci siamo incontrati (finally we have met)! Dove sei stato per tutta la mia vita (where have you been all my life)? Never before had I encountered a moment that begged more for fluency in Italian. Only an impassioned retort in the language of Puccini himself could defend the arias. I encounter a similar need for Italian to “speak for itself” when I teach Dante’s Divine Comedy. While English translations let us taste Dante’s genius, only readings in Italian would satisfy the intricacies of the text. This is perhaps partly why the wonderful artist Roberto Benigni has enjoyed much success with his one-man show Tutto Dante, a performance that ends with Benigni simply reciting cantos from Dante’s masterpiece. Through these moments I began to understand that every language has an essence and emotion that cannot be translated. And this is the origin of my present lingual pursuit. I want to speak what Puccini and Pavarotti make me feel. I want to recite cantos from Paradiso. Language learning should be in my blood. Both of my parents are multi-lingual. My dad has a Masters of Biblical Languages and can converse fairly well in French and probably a couple of other tongues if necessary. (His favorite language, though, happens to be Italian, although he hasn’t had as much study in la bella lingua). My mom is fluent enough in French and Latin to teach these languages to others. She can also keep up in conversations in Spanish and German to some degree. My only sister is earning her Bachelor’s degree in French and studied near Paris this last spring semester. (My mom and sister have a tendency to interrupt their English with lovely French phrases). One of my brother’s is earning a Masters in Spanish, and most of my other brothers are fairly conversational in Spanish as well. My youngest two brothers even know a bit of sign language. (As you can probably tell, I have a lot of siblings, and they are all fabulous). My husband, also, can carry on a conversation in Spanish, learned mostly through working many years in restaurants. But the language my family is desperately missing is Italian. Thankfully, if not prophetically, every language I have tried to speak (French and Spanish) comes out with a suspiciously Italian accent. It simply makes sense to learn the words that match the sounds. I was also mistaken for coming from strong Italian ancestry when I was young because my darker features contrasted so strongly to my blonde and fair siblings. (Thankfully two of my youngest brothers share my features, and my youngest brother in particular was born with a full head of dark hair, which assuaged any suspicions of scandal as to my parentage). Destiny seems to be in my favor. So, with the purchase of Berlitz Basic Italian, a grammar exercise workbook, and a book of the most common verbs and their conjugations, I’m committing. I loaded my Netflix queue with Italian films (favorite so far is Benigni’s amazing The Tiger and the Snow). I contacted the Italian professors at my university about events on campus; my first conversation hour (l’ora Italiano) is a week away. I starting reading Diane Hales’ La Bella Lingua. And, of course, I commemorated this journey with a glass of Chianti raised to a hope of success. I very much look forward to offering stories of this pursuit for all of you. It will be a celebration, indeed, when I can weave Italian into my posts without the use of an online translator or similar resources. Ho scritto una storia d’amore senza inizio e senza fine…per scriverla con te. (I have written a love story without a beginning or ending…so that we may write it together).